The Tale of the Spirit of Cuteness is the first chapter of Yoshi Topsy-Turvy. Before it begins, Yoshi finds the Spirit of Cuteness and she tells him that the Egglings were transformed into apples. She, then, asks him to retrieve these apples and turn them back to normal. 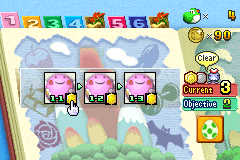 Yoshi is granted a Happiness Medal for each mission he completes. A simple introductory mission that serves as a tutorial with explanations. The first part is a grassland made of cardboard where Yoshi learns to unroll a rolled-up carpet. In the second part, there is the first wall that must be walked on, followed by a slope. The third part is an icy halfpipe that must be used to jump higher by changing gravity. The fourth and final part is a purplish area where Yoshi learns to ride a Chime Ball through Chime Notes to the Goal. The first part of this mission includes changing gravity to walk up a long wall where the first Igashira-kun is found. In the second part, an area with tall plants, Yoshi can use cannons to progress. The third part is a simple ice slope with no enemies or obstacles. The final part is a ice halfpipe with some platforms and the Goal. The first part is a pit with a Lift crossing it and a Piranha Plant on the bottom. The second part is a big ice slope where Yoshi rides a snowball. The third part is a small area with a single cannon and three apples hanging above it. In the fourth area, Yoshi rides Chime Balls through a zig-zag path, playing a short part of Yankee Doodle, followed by the Goal. This page was last edited on July 22, 2018, at 22:14.